An experimental sidewalk by Clark County. The County saved $35,000 by opting for porous concrete over installation of a storm drain. The concrete will let four inches of water pass through each minute. The City of Portland is experimenting with four different pervious paving options along a four-block portion of North Gay Street. 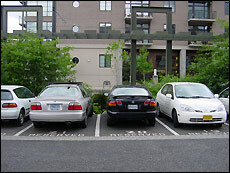 The options include porous concrete along a full block, porous concrete in the parking lanes only, porous asphalt on a full block, and porous asphalt on parking lanes only. When the owners of The Lakeside Gardens re-landscaped their entryway, they included permeable pavement on the driveway into the garden to lessen the stormwater runoff to the sensitive habitat areas below. As part of their gold-level Leadership in Energy and Environmental Design (LEED) award from the US Green Building Council, Ecotrust used permeable asphalt in addition to bioswales in their parking lot stormwater management system. From SE Fourth and Ivon three miles south along the east side of the Willamette River. 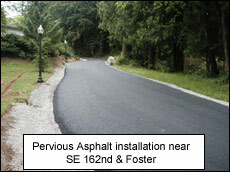 Porous asphalt was a natural choice for the Springwater on the Willamette trail because of its close proximity to the Willamette River. 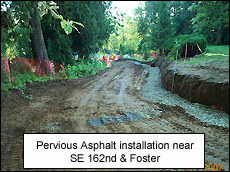 Porous asphalt will minimize stormwater runoff created by the new trail.